One of the main components of your car's braking system are your brake pads, which are important when it comes to the safety of your vehicle. The braking system in your car could suffer from damage if your brake pads are wearing out. 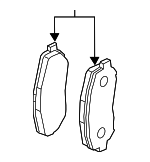 There are actually different types of brake pads that you can choose for your vehicle. Metallic brake pads are one of the most common types, with ceramic pads being a more popular choice for high performance vehicles.